Mr Saville pleaded not guilty to a charge of criminal damage. A Bristol student has been charged with causing criminal damage after allegedly writing part of a poem about liberty in chalk on a pavement. Paul Saville, 23, is studying sociology and criminology at the University of the West of England. The second-year student is alleged to have written the protest message on the ground in Broadmead. 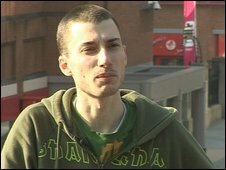 He pleaded not guilty at Bristol Magistrates Court and is due to appear again on 9 April. Avon and Somerset Police confirmed it had charged Mr Saville with causing criminal damage under the value of £5,000, but would not comment further.